How do I care for my Aqua Smoke vaporizer? Drain every 2-3 days to maximize vapor production and lifespan: Remove the coil from the tank. Drain any remaining E-Liquid from the tank and flush with hot water. A cotton swab and isopropyl alcohol may also be used to clear the tank of any remaining E-Liquid residue. Allow the tank plenty of time to dry (10-15 min). Use canned air if available. Although it is possible to drain, clean & refill a single tank with different E-Liquid flavors, it is not recommended. Cross contamination of the flavors may occur yeilding an undesirable taste. Be sure to thoroughly clean the tank before changing flavors or rather, just purchase a separate tank for each flavor that you use. Remove tanks when not in use. Charge batteries for 4-5 hours upon opening. 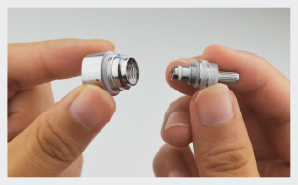 By design, all tanks will leak a small amount into the battery contact (the threaded part that connects to an atomizer). For optimal results, be sure to periodically clean the battery contacts using a cotton swab (and isopropyl alcohol if necessary). You should always clean the contacts before charging the battery to ensure proper conductivity. Detach all tanks & atomizers from the battery when not in use. A tank can potentially leak E-Liquid if the unit is not stored properly. 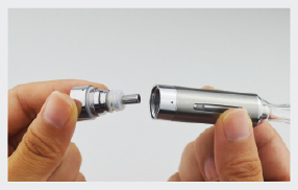 Direct contact of E-Liquid with the battery may cause the power unit to malfunction. Coils should be replaced every 10-15 days of use or when they lose their ability to wick properly. If you are detecting a burnt taste the coil most likely needs to be replaced. Changing E-Liquid flavors and not changing the coil may result in an undesirable taste. We recommend that you change coils whenever you change E-Liquid flavors. Aqua Smoke Premium E-Liquid should be stored in a cool, dark area away from direct sunlight. Aqua Smoke E-Liquids and products may contain nicotine and should be kept out of reach from children and pets. How do I refill my Aqua Smoke vaporizer? Remove the coil housing from the tank. Drip E-Liquid alongside the inner wall of the tank up to the fill line. Be careful not to over-fill as leakage may occure. DO NOT insert E-Liquid into the center hole in the tank as this may damage the device. Replace the coil housing onto the tank. How do I replace the coil in my Aqua Smoke vaporizer? Below is a video that shows an easy fix for contact issues. It can done on batteries or atomizers. Carefully unscrew the tank from the coil housing. Remove old coil by unscrewing it from the housing. Thread new coil onto housing and re-attach to tank. 1) Does the button LED light up when you push it? IF YES: Then try testing the battery with multiple tanks. If you've tried several working tanks and coils, and the vaporizer still does not produce any vapor, the battery might be defective or you're experiencing a contact issue. IF NO: The battery might be locked. Aqua Smoke batteries have a button lock/unlock feature. To lock or unlock the battery, push the button 5 times within 1.5 seconds. The button will flash indicating a switch in modes. 2) Does the button LED flash or light up when it is attached to a charger? IF YES: Fully charge the battery. The charger light will turn red during the charge and back to green when the charge is complete. Once the battery is fully charged, if it still does not power any tanks and coils, then it might be a contact issue (usually due to over or under tightening). IF NO: It could be a contact issue, defective charger or defective battery. If the charger works on other batteries, then it's probably not the charger. Be sure your batteries are fully charged. When you insert your battery into a charger, the battery light should blink several times. Similarly, the charger light should change from green to red. When the battery charging has successfully completed, this light will return to its original color of green. If the battery LED does NOT light up AND no vapor is produced when you attempt to use it, you typically either have a dead battery. Charge the battery and try again. 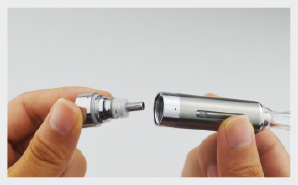 If the battery LED does light up and no vapor is produced when you attempt to use it: Try using and testing this battery using a different atomizer. If this battery works with all other atomizers, then this battery is not faulty. Aqua Smoke batteries have a life span of 3-6 months when used normally. If your battery is older than this it may be time to replace or upgrade to a larger capacity power source. If you suspect that a tank is faulty, test it using other batteries. If the tank will not work with any batteries and/or coils then it is most likely faulty. If it will work with one battery but not the other, then the problems lies within the battery. Be sure that the tank is properly filled with E-Liquid. Ensure that the gasket seal between the inner tank and coil is closed and air tight. Failure of this seal may result in E-Liquid leakage. Poor vapor production: Replace the coil. Burnt or unpleasant taste or odor: Clean tank and replace the coil. Your passthrough is plugged in but not producing any vapor: The USB passthrough requires a power source of 1500mA in order to work. Most computer mini-USB power sources will provide ample power. If you experience issues using your computer as a power source, try using another USB port or another computer if available. Your passthrough suddenly stops working, the LED just blinks and you are using the same USB port that you've always used: We have found that this malfunction is usually caused a faulty switch in the passthrough. Normal use of the passthrough can cause this. Contact from liquid will also cause this. No matter how careful one is, liquid seems to find a way into the switch. Try wiping down the contacts and letting the passthough sit for 3-4 days. After this time, try using it. We have found this to help in some cases. If this does not work, the passthrough will need to be replaced. Try preheating your Aqua Smoke vaporizer. Hold down the button on your battery for 2 seconds before inhaling. Take longer and slower inhalations. Why am I experiencing a harsh burnt taste from my vaporizer device? Aqua Smoke vaporizers use a coil based system to heat the E-Liquid, similar to one found in a light bulb. 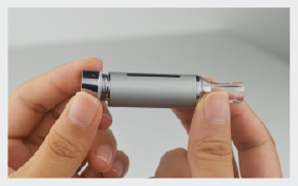 This wire-coil heats up to vaporize and deliver the E-Liquid in a smoke-like form. The unpleasant burnt taste is usually a sign that there is either a lack of E-Liquid in the system or that the coil is bad. This can be true even if your cartridge or tank is full of eLiquid. Solution: When you first fill the tank, let it sit for 5-10 minutes before using it. If present, wait until the rope wick turns from white to a clear, translucent color. The rope wick needs time to soak and draw liquid onto the wire-coil. This is known as "priming" and will help avoid any burnt tasting vapor. 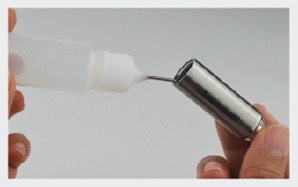 The viscosity of your E-Liquid can also cause an issue. Full VG liquid is usually to thick and will not absorb well in rope wicks unless it is diluted with a small amount of water. Aqua Smoke's patented blend of E-Liquid is designed for optimal usage in all Aqua Smoke E-Cigs and vaporizers to prevent this issue. Why should I keep spare parts? Coils can burn out at anytime. They last anywhere from 10-15 days of moderate use. We recommend having at least 2 spare coils in case one burns out. The capacity of Aqua Smoke vaporizer batteries depreciate over time and from use. They come in contact with liquid from daily use which may unexpectedly shorten their lifespan.